The main role of air is to make ice cream soft. And without it our ice cream would be a solid block, more like a lolly or popsicle. Certainly nothing we'd call ice cream. But air also affects the sensory properties of ice cream. Ice creams that contain lot's of air seem lighter and fluffier. While ice creams that contain less air seem thicker, denser and even creamier. 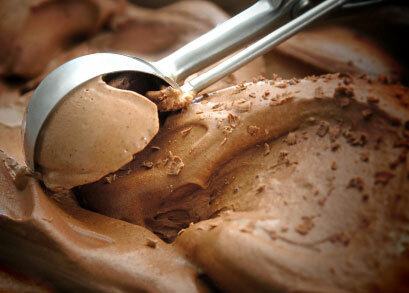 For example, one of the fundamental differences between gelato and ice cream is the amount of air each contains. Thick, creamy gelato has much less air whipped into it than lighter, fluffier ice cream. Since air is free and ice cream is sold by volume rather than weight, economy ice creams tend to contain lots of air. Whereas premium ice creams will have less air, both to distinguish them from the economy products and to create a luxurious, creamy mouth-feel. However whether you prefer ice cream with lots of air or less air is entirely a matter of personal taste! How do we add air to ice cream? For us homemade enthusiasts, it's the rotating blades of the paddle (or dasher) that whip air into the mixture while it's churning, much like a whisk will whip air into whipping cream. How much air is added depends on several factors: the design of the dasher, the speed it rotates at and how long we churn the ice cream for. Fast dasher speeds and long residence times produce ice cream with more air. How do we measure the amount of air in ice cream? The amount of air in ice cream is measured as the percentage by which the air increases the volume of the mixture. And this measurement is called the "overrun". So if 1 quart of ice cream mixture becomes 1.5 quarts of ice cream once the machine has finished churning, we say that the ice cream has an overrun of 50%. Because it's volume has increased by 50%. America's Choice Premium "Vanilla Bean"
Haagen Dazs "All Natural Vanilla Ice Cream"
Stonyfield Farm "Gotta Have Vanilla"
Domestic ice cream makers have much slower dashers and consequently the ice cream they produce has much lower overrun. As the air is whipped into the mixture, we want to make the bubbles as small as possible and they need to be stabilized so that they don't grow bigger or even escape from the ice cream altogether. When the ice cream is first removed from the machine the average bubble size is around 23 μm. But after hardening in the freezer that average size increases to 43 μm. Since the average ice crystal measures around 25 μm, the final air bubbles are significantly bigger. By the way, a "μm" is simply the abbreviation for a micrometer. There are 1000 micrometers in 1 millimeter. So they really are quite small! When the air bubbles are first introduced by the dasher they're quite large. But the blades of the dasher gradually chop them up, making them smaller. The faster the dasher rotates, the smaller the bubbles! The thickness or "viscosity" of the mixture also affects the size of the air bubbles with thicker mixtures producing smaller bubbles. This is apparently due to the increased shear stress applied in more viscous mixtures. And of course the longer we keep the ice cream in the machine, the more air that's added and the smaller those air bubble become. Once we've got those small air bubbles into the ice cream, we want to keep them there and keep them small. Because their natural inclination is to join up to form bigger air bubbles. So we want to stabilize the small air bubbles. And this is largely the responsibility of the butterfat in the milk and cream. I talk about this in much more detail in the page on the importance of fat in ice cream. But essentially while the mixture is being churned, tiny globules of fat start to come together to form long strings of fat. And these strings form a type of scaffolding, that surrounds and supports the air bubbles. This also stops them coming together to form larger air bubbles. The milk proteins play a supporting role here as they attach themselves to the surface of the air bubbles and aid that stabilization. Don't forget that stabilizers and emulsifiers can also help keep those air bubbles small and in place. Stabilizers will increase the viscosity of the mixture, which as we've seen produces smaller bubbles. 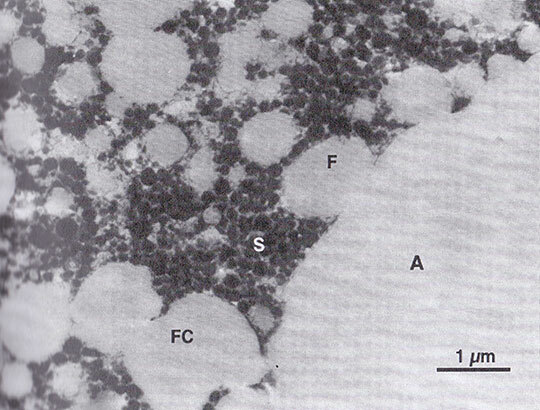 And emulsifiers encourage partial coalescence of the fat globules to create those strings of fat that support and constrain the air bubbles. We can't actually see it or taste it, but air plays a very significant role in ice cream. It keeps it soft and scoop-able. And it also influences how thick, creamy, light or fluffy the ice cream is: and these are important sensory properties. How much air is added to ice cream depends on the design of the paddle (or dasher), how fast it rotates and how long we keep the mixture in the machine. But the dashers of domestic ice cream makers rotate relatively slowly, so they tend to add quite low volumes of air, producing ice cream that's thick and creamy. If you want lighter, fluffier ice creams, look for a machine with a faster paddle. My best ice cream maker guide will help you here. It's important to keep the air bubbles small and stable in the final ice cream. And to do this, we need a well balanced mix with enough butterfat to form the strands that will support the bubbles and enough protein to help them. 1. Clarke C. (2004), The Science of Ice Cream. Royal Society of Chemistry.